Dental implants can be a great way to replace missing or damaged teeth. Dental implants have a very high success rate, and are considered by many Periodontists to be a permanent tooth loss solution. The dental implant process involves several steps, with each case being unique. The first step of the process is the evaluation, where we diagnose your specific case. We will then provide you with a treatment plan.Â Having performed hundreds of implants, we have a very high success rate while using the best materials and equipment. The implant site must first be prepared, which may require other periodontal services. A titanium post is inserted into the bone and allowed to heal for several months. Once the site has healed, a cap is placed on the post and the patient can then have a crown placed over it. 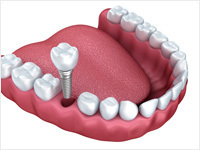 If you have a missing or damaged tooth, a dental implant may be the best option to correct it. Implants are considered by many to be the only permanent solution to tooth loss. Take a look at our patient education videos on dental implants for more information.